Capped by a protective steel mesh screen, tresARCA house is built for indoor/outdoor living. There are two ways to live with Las Vegas’ harsh climate. The first, epitomized by the hermetically-sealed tract houses ringing the Strip, rejects the reality of the desert in favor of air conditioning and architecture evoking far-off places. The second strategy embraces the environment for what it is, and looks to the natural world for cues about how to adapt. 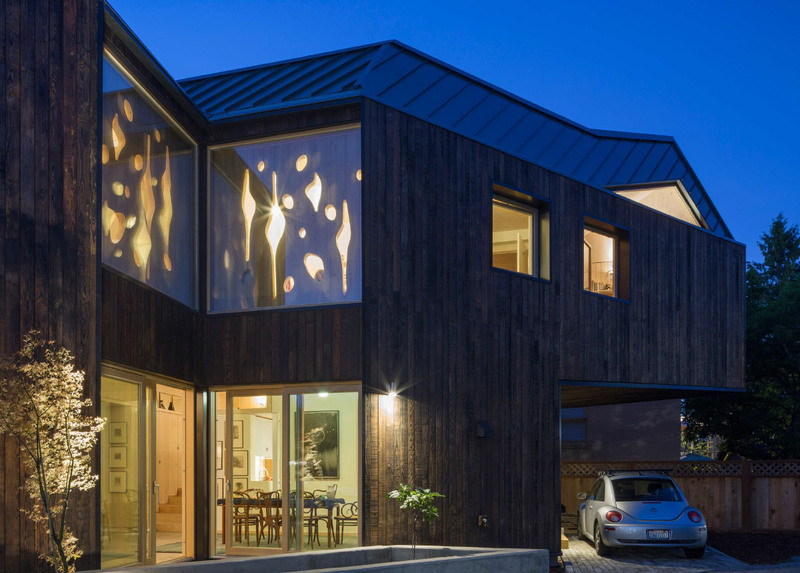 In their tresARCA house, assemblageSTUDIO took the latter approach. 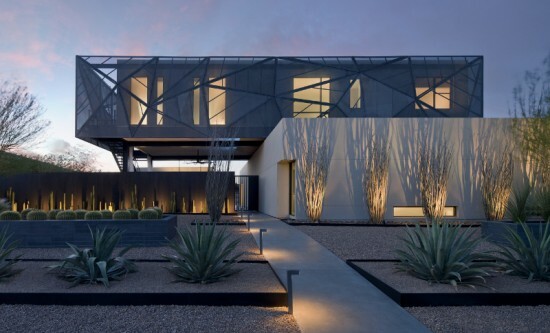 Glass and granite punctuated by a folded steel screen surrounding the second-floor bedrooms, tresARCA’s facade is a meditation on the resilience of the desert landscape. “The mesh screen idea came from looking at various shadow patterns in the desert and the idea of the cracked desert floor,” said principal Eric Strain. On a practical level, the screen catches heat before it reaches the bedrooms, allowing daylight to filter in without raising the interior temperature. Aesthetically, “the idea was that the home sits at the base of the Red Rock Mountains, the background scenery is the stratification and the layering of the Red Rock Mountains,” said Strain. “To not copy, but [to] suggest that layering is where the folding nature [of the screen] came from.” JD Stairs fabricated the screen using mesh from The Western Group. The company, which provided the home’s other non-structural steel components, including fencing and the vault-like front door, was tapped for the job partway through the design process. Having never built something of this scale, they staged several full-scale mockups, at one point renting a parking lot to lay out the entire structure.